Talking about the thoughts and process behind MethodKit for Team Development. 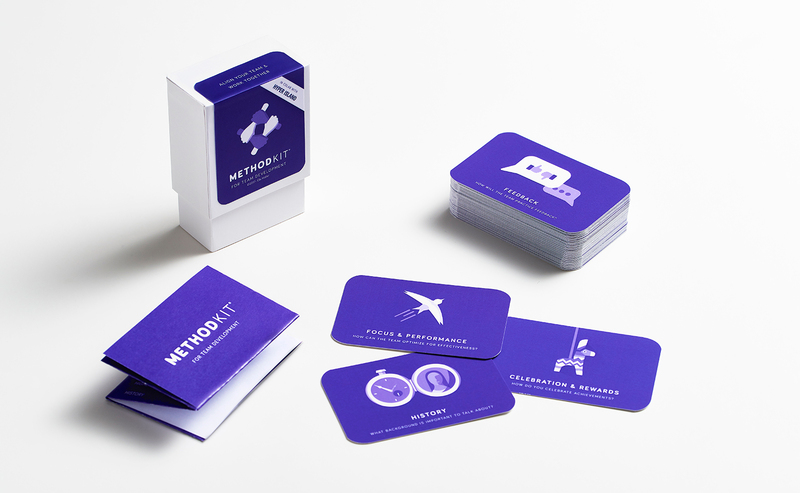 We defined the essential building blocks of teamwork and transformed them into a deck of cards. Use them to create a framework for workshops, as conversation starters, or as a checklist when working with team development. Read on to find out how and why we did it. It’s the elemental lifeblood of every organization. A craft that most of us practice every day. A discipline that can create magic (when done well) or chaos (when done poorly.) Working together with other humans is something we’re expected to do from an early stage in life, but very rarely something we are trained to do. Take a moment to consider an exceptional team that you have been a part of. One that really exceeded the sum of its parts and generated great results. A project team at work, maybe? A sports team? Even a family? Reflect for a moment on what made that team effective. What were the qualities and characteristics that made its collaboration stand out? More likely than not, that team was great because it successfully struck a balance between the many important elements that enable collaboration: Maybe your team had great leadership? Clear goals? Strong relationships? Or maybe you had the right mix of skills? A strong sense of purpose? The right routines? Probably, it was a combination of some of these and more. Great teams succeed because they are able – either intentionally or intuitively – to put in place enough of the right elements order to thrive. The challenge is that we lack a shared vocabulary for these essential elements of teamwork. Most teams improvise the process as they go along, working with a mix of intuition and previous experience. What’s missing is a clear overview of the building blocks of teamwork. Teams need an interface. A shared language, shared vocabulary to make the intangible aspects of human dynamics tangible. What are the building blocks of teamwork? So, what are the building blocks of effective teamwork? How do you distill this complex, messy human process and articulate it as a series of discreet units? Hyper Island has over 20 years of experience working with team development and group dynamics. Drawing on heaps of experience and research, they have distilled a robust methodology for teamwork. Meanwhile, Methodkit has spent the past 5 years rigorously mapping areas and disciplines ranging from project management to public health, wedding planning and architecture. We’ve gained a great deal of insight into how to collect, organize and filter the key elements of an area. We drew on all this to create a (very) long list of important elements in teamwork. We then worked through that list meticulously combining, tweaking and prioritizing to craft the essentials. This is Methodkit for Team Development. Cards provide a framework for people to build workshops, conversations and ideas around. They are deliberately simple and easy to use. We have found this allows for greater conversation. We don’t want people to drown in information, but rather use the cards to spark conversation and ideas. At the end of the day, it is the ideas that matter, not the tools used to create them. How to use this kit in workshops? Designed to be used at all scales from grand projects to small interventions, MethodKit for Team Development offers a visual overview of the most important elements, actions and aspects of collaboration. Use it to create a common language in your team, as a tool to structure team meetings at various stages of the process, or just to think deeper about the nature of teamwork. Project Point of Departure: Use the kit as a framework for a project kick-off workshop. Select 10-15 cards that represent the most important elements for the team to define/agree upon at the beginning of the project. Lay out the cards on a table or post them on the wall. Explore and discuss each card using post-its to document ideas and agreements along the way. Team Alignment: Use the kit to help your team stay aligned and focused throughout a process. Have short alignment meetings in which each member chooses one card that they feel the team should discuss. Spend 10 minutes on each card, sharing perspectives and reflections as a team. Evaluation Processes: Use the kit to structure wrap-up or project evaluation session. Choose a selection of cards that represent important areas for the team to look back, reflect on and evaluate. Work through each card, discussing what went well and what could be improved in that area. Team Coaching: If you work as a coach or facilitator of teams, you can use this kit in a range of simple workshop methods. For example, in a team coaching session, invite the team to collaboratively choose 7 cards that they believe are the most important areas for them to develop. Then use those cards to craft reflection questions, team-building exercises and other supporting mechanisms. There is no magic formula for great teamwork. Collaboration, by its very nature, is a complex, messy and distinctly human process. Yet, equipped with the right toolbox, team development doesn’t need to mean stumbling around in the dark. When we remember to put focus and attention on a key set of fundamentals, we can create the best possible conditions for our teams to succeed.